In the following section you will find past projects the lab completed. Certain spinal surgeries require the insertion of an implant between two vertebrae to stabilise the spine while it heals. One possible complication of this anterior fixaton procedure is settling of the implant into one or both vertebrae, which can result in pain, loss of nerve function, and/or, loss of stability. This complication is most common in osteoporotic patients, who are forming a larger proportion of patients requiring this procedure as the average population age increases. 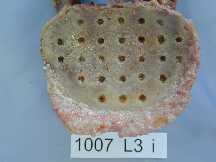 The strength distribution of the vertebral endplates (top and bottom of the vertebra) in "normal" spines is not well known, although some theories have been advanced. Its changes with disease processes and normal aging are not known at all. It is well known that bone strength decreases as bone density decreases (with age or osteoporosis). Vertebral strength also decreases as the intervertebral disc degenerates. A large proportion of the patients receiving these implants are in one or both of these "higher risk" groups. What is not known is how the distribution of strength changes. It is possible that, while the overall strength of the bone decreases, it drops faster in some regions of the bone than in others. By identifying stronger regions in the bone, it may be possible to take advantage of these by modifying the shape or placement of implants to reduce the risk of subsidence. We are doing studies looking at the strength distribution (stiffness and failure load) across the vertebral endplates of human spines using indentation tests. The specimens range from "healthy" to "degenerate" (disc degeneration, osteoporosis). This enables us to look at both the distribution in "normal" individuals and changes that result from degenerative changes. Financial support for this work has been obtained from NSERC and the George W. Bagby Research Fund. Fractures of the proximal humerus are common, with an incidence similar to that of hip fractures. This injury is being increasingly encountered in our aging population because it is often related to weak, osteoporotic bone. While the majority can be treated nonoperatively, approximately 20% are complex fractures which require surgical stabilisation, either with internal fixation or by prosthetic replacement. 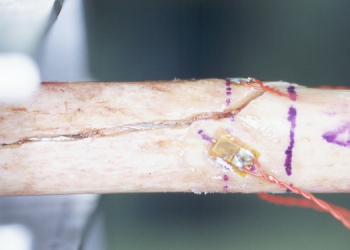 The optimal method of internal fixation is not currently agreed upon. In addition, recent biomechanical studies have suggested that in cases of poor bone quality, the use of a calcium phosphate cement is an effective load sharing adjunct to traditional fixation. 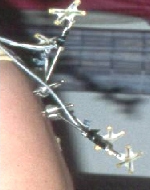 Our objective in this study was to contrast the biomechanical fixation of two commonly used internal fixation devices (cloverleaf plate and 90° angled humeral blade plate, Synthes Canada) and to determine the effect of calcium phosphate cement augmentation (Skeletal Repair System, Norian) on fixation. Cadaveric humeral pairs with three part fractures were tested in the Instron using three loading protocols: cyclic passive abduction (Figure 1), cyclic external rotation, and external rotation to failure. 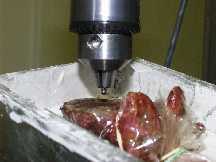 Six degree of freedom interfragmentary motion was measured with the Optotrak camera system. Figure 2 shows the torsional failure of a proximal humerus construct with blade plate fixation. Motion results revealed no differences between implant types for the three tests and no difference with SRS for interfragmentary motion in abduction. Motion in torsion was significantly less with SRS and torque to failure was significantly increased with SRS augmentation. A correlation was found between bone density and failure torque in specimens without SRS but this relationship did not appear in specimens with SRS. The ability of a material to negate the relationship between low bone density and low failure loads would be a valuable asset. Financial support for this work has been obtained from the Canadian Orthopaedic Foundation. Implants and cement were provided by Synthes Canada. Periprosthetic humeral fractures following shoulder arthroplasty have a 1% to 3% incidence rate. To determine whether reaming to a clinical diameter significantly reduces the torsional strength of the humerus. To determine if the ratio of reamer to intramedullary canal diameter is a clinically practical measure of the margin till fracture. reaming of the intramedullary canal. at Dclinical, the change in strain ranged from 3% to 142%, with an increase of over 50% observed in four specimens. statistical analysis showed a significant difference was found by reaming to Dclinical on the lateral and posterior aspects. correlation coefficients for the lateral, anterior, medial, and posterior gauge locations were 0.43, 0.13, 0.29, and 0.70 respectively indicating a variable relationship. Advancing to a reamer size, which engages the endosteal surface, has a high risk of significantly compromising torsional humeral strength. 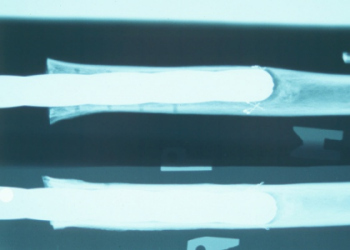 The ratio of reamer diameter to intramedullary canal diameter by itself is not a definitive measure of the margin till fracture. Financial support for this work has been obtained from DePuy Canada. External fixators are used for preoperative evaluation of potential lumbar or lumbosacral fusion in patients with low back pain (LBP). 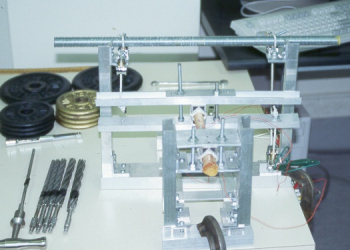 These devices are applied to investigate the effectiveness of a potential internal fixation, with the final goal to fuse the segment. The cause of chronic LBP is often difficult to be determined with the conventional imaging and motion analysis methods. It is conjectured that LBP can be caused by abnormal intervertebral motion patterns. The present study investigates the path of motion in patients with LBP who underwent external fixation surgery. The 3D - motion of the implanted transpedicular screws (Schanz screws) - and thereby the path of motion of the involved vertebrae - was measured before the attachment of a demobilising fixator-frame. Optoelectronic markers were fixed to the screws and the patients performed typical activities (flexion/extension, axial rotation, lateral bending, one-leg-stance, sit-down/stand-up). 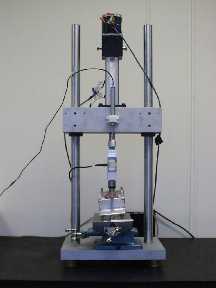 The effectiveness of the measurement method has to be determined first. 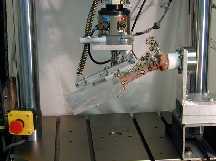 The here described method allows to internally check whether the screws are rigidly connected to the vertebrae, since the system is overdetermined when at least four screws are involved in the measurement. Preliminary results have shown that the intervertebral motions in most of the investigated segments were measurable. Further analysis in more LBP patients has to be done to determine whether instability does result in a typical behaviour (i.e. coupling pattern) or extensive intervertebral motion. out of the skin of the patient. Lund T, Rathonyi G, Schlenzka D, Oxland TR. The external spinal fixator does not reduce anterior column motion under axial compressive loads. 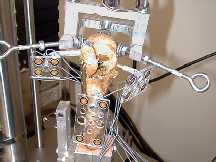 A mechanical in vitro study. Acta Orthop Scand 1999 Feb;70(1):37-41.